SUPERHUEY | Love Productions Inc.
Is the Heart of Rock & Roll still beating? You bet it is! Huey Lewis and The News have carried the banner as the quintessential American rock band, endearing them to millions of fans and earning them the right to mark their place in pop music history. With a nearly unbroken string of hit songs, their music became the soundtrack for a generation. During the 1980’s and early 1990’s, they scored a total of 19 top-ten singles across the Billboard Hot 100, Adult Contemporary and Mainstream Rock charts. 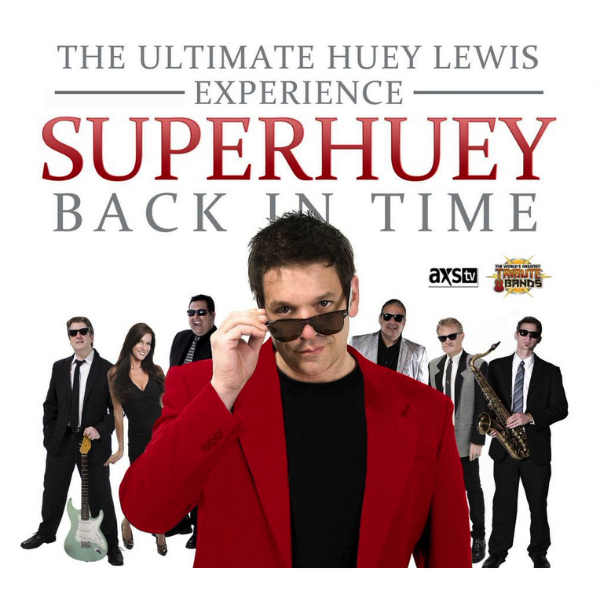 Super Huey – The Ultimate Huey Lewis Experience is the only show of it’s kind anywhere in the nation. This seven piece explosive show performs across the United States firing up appreciative audiences of all ages at fairs, festivals, sporting events, arenas, and showrooms with their super high-energy faithful renditions of feel good music that defined an entire generation.